Stunning images are coming from Lower Puna as the Kilauea Volcano lava flow meets the sea. Madam Pele has completed her four-mile journey to the coastline. Lava from Fissure 20 has reached the ocean, creating a new public health hazard that officials are calling “laze.” Laze is formed when lava flows into the ocean. It is a poisonous gas that contains hydrochloric acid and steam and may contain tiny glass particles. It can result in eye, lung, and skin irritation. 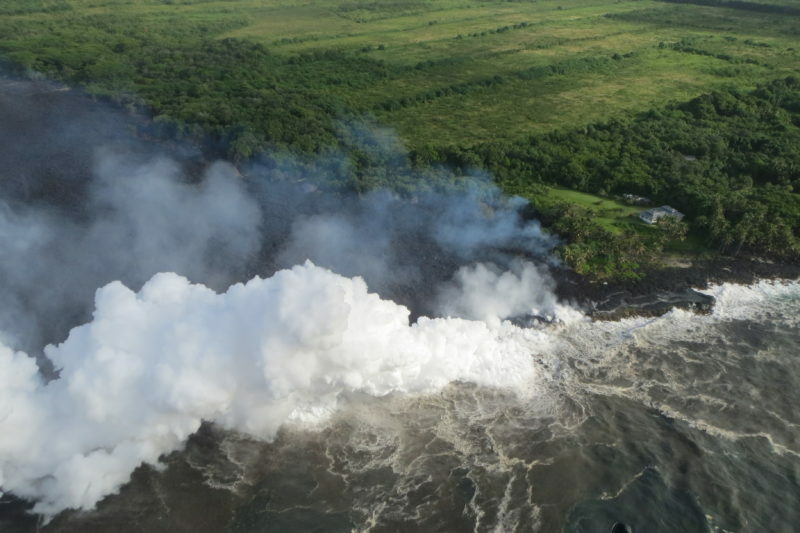 The U.S. Coast Guard is monitoring the area closely and has established a safety zone 300-meters from the lava’s entry point. Recent volcanic activity in the Leilani Estates subdivision has seen new fissures form and merge. Dozens of homes in the area have been isolated as a 20-foot tall wall of lava has blocked roads in the area. Some residents have been air-lifted to safety. Explosions at Halemaumau Crater at Kilauea’s summit have sent plumes of ash 20,000 feet into the sky. Communities downwind from the plume have seen significant ashfall, and officials are providing dust masks to residents in the affected areas. Certain areas and roads in Lower Puna are open only to local traffic, as Civil Defense and other agencies continue to monitor an ever-changing situation. Seismic activity continues. One man has been seriously injured by lava spatter recently, underscoring the importance of staying away from the active volcanic zone. Fountaining lava is extremely dangerous, however localized it might be. The affected area is less than 20-square miles on an island of over 4000 square miles. The volcanic plume from Halemaumau Crater and resultant “vog” can affect areas many miles from the active zone. Visitors and residents are advised by officials to avoid the affected areas and allow Civil Defense and other agencies to focus on responding to a constantly changing situation. For updates from Civil Defense about current conditions, advisories and warning, click here. For images from the volcanic zone and affected areas by the US Geological Survey, click here.